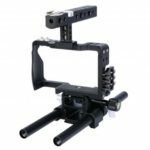 PULUZ PU3020B is an aluminum alloy cage kit built for Sony A6300 / A6000. This cage adds protection, stability, and mounting options to your camera. The hot shoe allows you to mount external lighting and radio equipment. 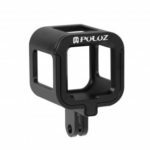 Ergonomic and anti-slip handle enables you to shoot stable images with one hand. Made of aluminum alloy, CNC machined process, sturdy and durable. 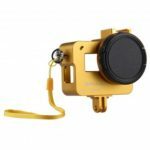 Hot shoe comes with different screw interfaces, can connect with various external devices. Anti-slip and ergonomic design enable one handed shooting for stable images. 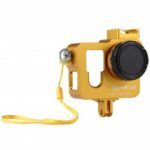 Framed with a hot shoe interface, easy to connect with external lighting and radio equipment. Convenient to use, no need of magic arm. Base plate with up and down adjustable rail road. When using handheld long zoom lens, adjust rod to support the cage. Three points fixed for easy stable shooting. 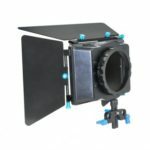 Can be used with different devices like matte box, microphone, external monitor, etc. Further improves the professional photography applications.